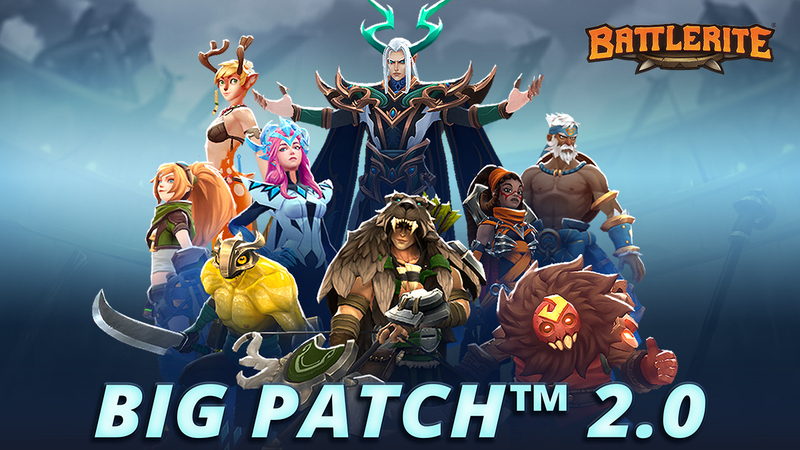 There are lots of large changes coming to Battlerite with this patch. You can read up on the thought process behind these changes in our Dev Update. Unlock unique rewards every Battle Season with the new Battle Pass feature! Battle Pass progress is shared between Battlerite and Battlerite Royale, giving players the freedom to progress their Pass however they choose. With the introduction of the Battle Pass come the Battle Seasons, starting with Battle Season 1. We’re restarting the season counter to make it clear when the Battle Pass and its related changes was introduced and that the Season is shared between both games. Progress your Battle Pass by leveling your Tier level, with each Tier level having new rewards to potentially unlock. 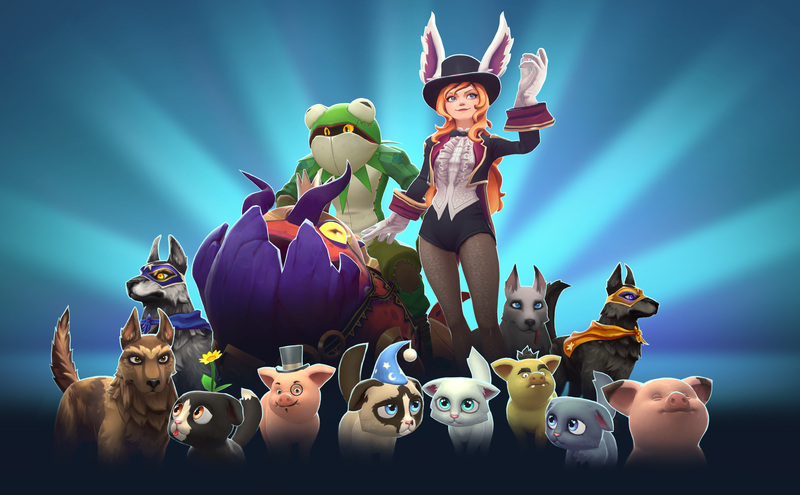 Advancing to the next Tier level requires 10 Battle Stars, which can be earned by leveling up your Season Level, completing Daily Quests, or completing Season Quests. Upgrade your Battle Pass to the Premium Pass to unlock rewards at every Tier level. Pre-purchase the Premium Pass here or purchase it in-game for 950 Gems. Players also have the option to upgrade to the Premium Pass and purchase an additional 15 Tiers for 2500 Gems in game (unless already pre-purchased). Tiers purchased after the max Tier of 50 will be converted into Season XP. All Battle Star progress is kept and applied to your new Tier level. The Season Level is a new type of Account Level that resets every Season. Gain 2 Battle Stars every time you level up, and 5 Battle Stars every 5th level. Once a player has reached a max Tier level of 50, any Battle Stars earned will be converted into Season XP, which increases a player’s Season Level. Season Level history will be shown in the profile from Battle Season 2 onward. Account Levels are still around! Account Levels now represent your total accumulated level from previous and current Seasons in both Battlerite and Battlerite Royale. No legacy Account Levels have been lost. Account Level is displayed in the profile, above your current Season Level, and in the Friends List. Daily Quests have been reworked and are now shared between Battlerite and Battlerite Royale. Each completed Daily Quest rewards 150 Battle Coins and 3 Battle Stars. Daily Quests can be progressed in Vs AI, Casual, and League. Don’t forget that Daily Quests still progress signed Sponsors! Sponsors are still around with the introduction of the Battle Pass, and can still be progressed by completing Daily Quests. They are now shared between Battlerite and Battlerite Royale. 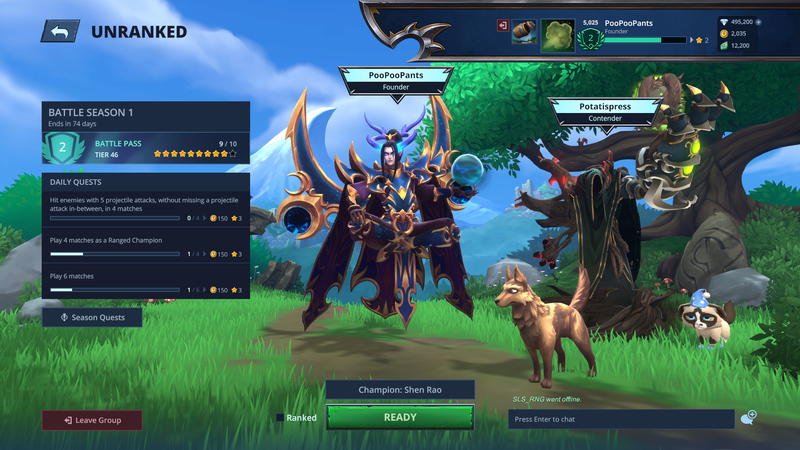 Champions that are rewarded through sponsors are now unlocked in both Battlerite and Battlerite Royale, though Champions no longer provide token compensation when the Champion is already owned. There are five sponsors for Battle Season 1. Three Sponsors return from previous seasons and two new Sponsors join them. The Stewards of the Arena are available for all players to progress and will unlock Raigon and a unique Raigon weapon and outfit. 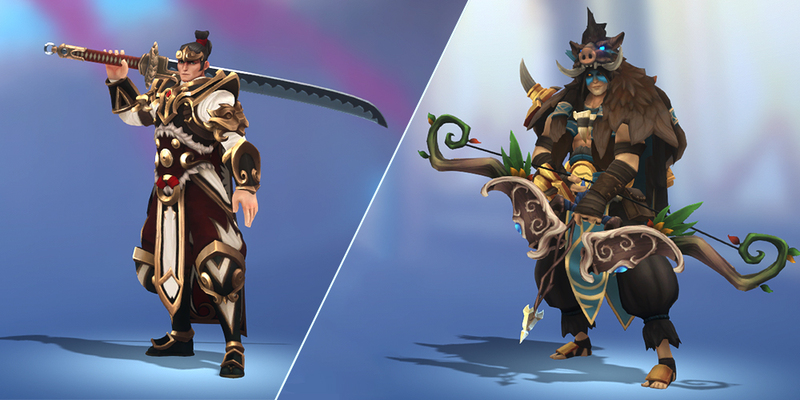 The Halls of Triumph sponsor is only available for players who have upgraded to the Premium Battle Pass and contains a unique pose, outfit, and weapon for Jumong. If you are still signed with a sponsor from Season 5 you will still be able to complete it. All sponsors from previous seasons will be marked with a star. Due to the change to Season Levels and introduction of the Battle Pass, Boosts have much more value than previously. For this reason, Boosts now grant a 50% Season XP bonus instead of 100% Account Level XP bonus. Boosts will still grant 100% Champion XP and double the Battle Coins earned from matches as previously. You can purchase XP Boosts in your profile. 10% Season XP Boosts can be earned by progressing through the Premium Battle Pass and stack additively. To be considered for leaderboard placement, you or your team must have at least 20 games played. The lobby now shows your team members, including their equipped Outfit, Weapon, Pose, and Pet! The number of emote slots has increased from 4 to 6. The UI will also now show which slot an Emote is equipped to with an icon indicator, and now shows the HUD Emote icon for easier recognition. As we addressed in a previous Dev Update on the Big Patch™, we’ve been looking at ways to diversify player choices and repetitive nature of rounds. We’ve decided to add in a new system that will allow players to personalize and customize each and every round to their liking with the Armory. Available before each new round, players can now pick a set of items (Equipment and Consumables) to bring with them into battle. These items are not persistent between rounds and the number of items you can choose to take into the fight increases by one each round, up to maximum of three. Every 15s, your primary ability deals 8 bonus damage and inflicts Fading Snare for 1s. When you fall below 50% health, you become invulnerable for 3s. Only triggers once per round. When your Ultimate is ready, your movement speed is increased by 10%. You receive +50% healing from Health Shards and +50% energy from Energy Shards. Every 15s, your primary ability heals you for 14 health. Excess healing is converted into a shield that lasts for up to 6s. Begin the round with a shield that absorbs up to 25 damage. You gain +15 % damage and healing output while the shield last. After using your Ultimate, regain 25% energy. Whenever another player dies, you gain +20% damage output for 8s. Bonus – Dealing damage to an enemy reduces their healing received by 15% for 2s. Every 15s, your current cooldowns are reduced by 1s each. Apply a salve that heals you for 36 health over 6s. Taking any damage breaks the effect. Throw a rock. Hitting an enemy deals 5 damage, inflicts Fading Snare for 0.5s and knocks them back. Throw a grappling hook. Hitting a wall pulls you to that wall. Drink to break out of any negative effect and turn into a rabbit for 3s. While you are a rabbit, you gain 50% increased movement speed and can hop twice to knock enemies back. Dash forward and grab the first enemy hit, dealing 6 damage. Upon hitting a wall with a grabbed enemy, inflict Stun for 1.2s to that enemy. Overload was designed specifically to deal with boring endgame scenarios. On the winning side, having an additional player means you have time on your side and incentivizes you to play in a safe and drawn out way. The losing side can’t win the long game against a team with reliable value like healing and more available abilities, so they have to take a risk to make a comeback happen. However, many players won’t take the risk even if it’s their only chance to win the round. Instead, they will run away hoping for their enemies to make a big mistake. It’s not a fun or particularly skillful way to play the game for either side and the predictable way these scenarios play out makes it even less fun. This wait is doubly painful if you are dead and want the round to end. Overload is meant to end rounds in way that is quick, fun, and fair. The damage amplification in both directions rewards aggressive play from both sides. The movement speed reduces cooldown reliance and allows the user to set the pace while the time limit forces them to take the initiative. We are increasing the comeback chances by making the game more volatile rather than giving the losing team an advantage. The winning team may need to play better to close out a round but they still have the advantage. Even if a user equalizes the game state through a kill, the remaining enemies have the option to overload if they too want to gamble on their skill. For additional reading material on Overload, check out your latest Dev Update at the local blog. Heals self for 20% of your missing health and boosts damage and healing output, movement speed, and ability cooldown rate. You take 40% increased damage during the effect. When damaged, the Explosive Barrel explodes after a 1.2 second delay. It deals 20 damage, and leaves a damaging fire area that deals 30 damage over 4 seconds. By stepping into the jump pad circle, you are blasted high into the air where you are unhittable. You rise and fall over a total of 4 seconds. After landing, you are stuck in a recovery animation for 1s and you inflict Incapacitate for 1.5s on nearby enemies. Jump Pads have a cooldown period of 40 seconds and begin each round on cooldown. With the addition of Armory, the era of the last generic rites has concluded. Jolting Amulet and Wind Walkers serve the role of Inspiration and Agility respectively and remove the need for these rites to exist. Armory will serve as the stronghold for generic effects usable by all champions, whereas Rites will firmly be the bastion of champion-specific augmentations. Inspiration and Agility rites have been removed from all applicable Champions. Croak has always utilized the same reloading ammo system that Iva, Ezmo, and Jade use. However, it works quite differently as Croak can still attack without ammo, just at a much slower pace. Changing his weapon system to use the charged weapon system in Royale really illustrated that it was a lot more consistent and intuitive this way. We’ve decided to bring that over to Arena. It stresses the importance of hitting the opening attack, is visually more obvious, and is more straightforward. Oldur’s Sands of Time (M1) rites have gotten some adjustments to allow for more strategic choices. Pestilus’s ability to command his Queen to move is a fundamental and vital part of his kit, and as such has been moved from the Hive Mind rite into his core kit. The Queen’s base speed has been reduced from 6.4 to 5, however the Hive Mind rite can be taken for those who need that extra flight speed. While Raigon’s projectiles aren’t gaining speed in this patch, they have been adjusted to better fit their visuals. Power has been transferred from both of Sirius’s Crescent Slash (M1) rites to his M1 to decrease the importance of those rites. Ulric’s series of Smite attacks has been adjusted to better reflect the size and impact of each attack. His movement slowdown is more dramatic for later attacks in sequence, as is the size of the projectiles.